The EUR-pallet - also Euro-pallet or EPAL-pallet - is the standard European pallet as specified by the European Pallet Association (EPAL). Pallets conforming to the standardization are eligible for the European Pallet Pool (EPP) - the EPAL pallet system allows for an exchange as "pallet for pallet". The EUR/EPAL-pallet is 1200×800×144 mm, it is a four-way pallet made of wood that is nailed with 78 special nails in a prescribed pattern. Only EPAL-licensed makers may produce EUR/EPAL-pallets. 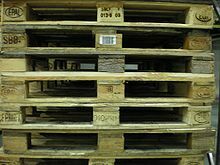 The Euro-pallet goes back to the wooden pallets used in railway transport. In 1961 the European railways commissioned the standardization of a common pallet type under the auspices of the UIC. The actual inventor is unknown but there are historic records of the effect - using the Euro-pallet it was possible to load railroad cars in just 10% of the time of earlier loading processes. In 1968 the association did also specify a standard lattice box along with a standard lattice box pallet. Following the standardization most of the European industry switched over to use Euro-pallets with trucks, forklifts and high-rack warehouses optimized for their size. National associations developed framework agreements for pallet exchange in that freight would be delivered on Euro-pallets and be given the same number of Euro-pallets in return ("pallet for pallet"). The Euro-pallets are controlled by the association and the association takes care of repairing or removing old pallets from the pool. With the ongoing European integration the European Pallet Pool allowed for pallet exchange even in cross-border dealings. With the success of the Euro-pallets a number of replicas entered the market that used low-quality wood which splintered easily and were prone to mould. So the European railways, which own the trademarks for EUR/EPAL, created a separate standardization body. The European Pallet Association was founded in 1991 and the EUR and EPAL logo may only used by licensees of that organization. The globalization has made for a decline of the EUR/EPAL system since the EUR-pallets do not fit well into ISO containers. It is still the most widespread pallet type in the world with an estimate of 350 to 500 million EUR-pallets being in circulation. One of the advantages is that the 800 mm does fit even through normal doors (the most common DIN door type is 850 mm by 2000 mmm). Derivates of the EUR-pallet have been developed for specific uses. The EUR-pallet - also EUR-1-pallet - was followed by the EUR-2-pallet and EUR-3-pallet which are both 1200x1000 mm which is close to the standard American pallet type of 40x48 inches. For usage in retail stores the EUR-6-pallet is half the size of the EUR-pallet with 600x800 mm.These Euro-pallet types have also been subject for publication as ISO standards. To accommodate for EUR-pallets there are derivates of the Intermodal containers that are about 2 inches (5 cm) wider - these are commonly known as "pallet wide" containers. These containers feature an internal width of 2440 mm for easy loading of two 1200 mm long pallets side by side - many sea shipping providers in Europe allow these as overhangs on standard containers and are sufficient to fit them in the usual interlock spaces. Especially the 45ft pallet-wide high-cube shortsea container has gained wider acceptance as these containers can replace the 13.6 m swap bodies that are common for truck transport in Europe - the EU has started a standardization for pallet wide containerization in the EILU (European Intermodal Loading Unit) initiative. § ISO 3394 Dimensions of Rigid Rectangular Packages, Transport Packages. The EUR-palett must use at least 78 nails of a specific type that are subject to a prescribed nailing pattern. The final palette weighs 22 to 25 kg. Only dry wood may be used so that it cannot start going mouldy. § On the left corner leg the EPAL logo is shown. Originally this was used for the railway company designation that was eligible to control the Euro-palet production. Since the control was moved to the EPAL many framework agreements require the EPAL logo however. § On the central leg the code of the producer company is shown along with the signatory of the verifier and the name of the railway company that installed the verifier. If the EUR-pallet had been repaired already then a round verification nail is put in the central chunk. The last numbers designate the production year and possibly a wood type indicator. § On the right corner leg the EUR logo is shown. The EPAL and EUR logos are encircled in an oval that resembles the nationality plate. 5. ^ "Standard Shipping Containers". Container container. Retrieved 2009-05-18. 6. ^ Frederik Hallbjörner, Claes Tyrén (2004). "Possible consequences of a new European container standard (EILU)". master thesis.